Intrinsic Yacht & Ship’s Mechanical Department’s full-time staff of experienced technicians offer a broad scope of customized services designed to fit each yacht’s individual needs. We are pleased to provide sales, service and installations for all systems on your boat with only the highest quality standards being used while we take care of your yacht. Your complete satisfaction is our only goal when it comes to your boat’s service & repair. Our service department is based out of Port Annapolis Marina in Annapolis, Maryland, and we offer mobile service to many areas including Ocean City, MD and many areas in Virginia, Delaware and Washington DC. We are dealers for Yamaha, Mercury, Garmin, Ocean LED, Propspeed, and Rydlyme, and our staff includes technicians who are certified by Mercury, Yamaha, Garmin, ABYC and more! Contact us today for a service free estimate. We are also available for mobile service upon request. 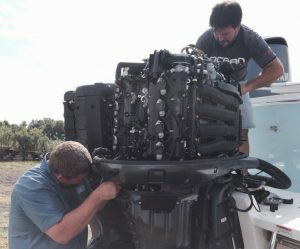 All service is completed by a professionally uniformed crew at our service yard where we can offer haul outs and land storage while your boat is being serviced.